In anticipation of his upcoming conference presentation, Combining Inferential Statistics with Predictive Modeling to Evaluate Changes in Your Business, at Predictive Analytics World for Business Chicago, June 19-22, 2017, we asked Thomas Schleicher, Sr. Director, Measurement Science at National Consumer Panel, a few questions about his work in predictive analytics. A: Although achieving “perfect” scores on your organization’s key performance indicators (KPIs) can be elusive under rapidly changing business conditions, the combined use of inferential statistics with a business-smart, predictive model process is one demonstrated way to achieve continuous improvement with respect to your KPIs. 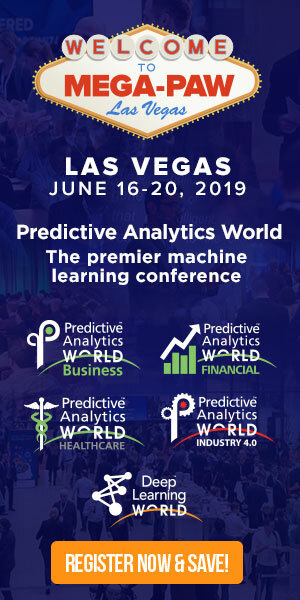 Don’t miss Thomas’ conference presentation, Combining Inferential Statistics with Predictive Modeling to Evaluate Changes in Your Business on Wednesday, June 21, 2017 from 4:15 to 5:00 pm at Predictive Analytics World Chicago. Click here to register to attend. Use Code PATIMES for 15% off current prices (excludes workshops).